Discussion in 'Reviews and Articles' started by ElGatoFlojo, Oct 9, 2008. I got my paws on the Elitegroup P43T-A2 motherboard, and I'm here to give you the scoop. I've got a little unboxing, some of the usual groping going on, and then it's time for the details. First, the technical details. It utilizes the Intel Eaglelake P34 Northbridge and Intel ICH10 Southbridge chipsets. The frontside bus supports 1333/1066/800 frequencies using a scalable Vcc_CPU. It accepts four DDR2 sticks with speeds of 800/667, and a maximum capacity of 16GB. DDR2 memory bandwidth of 12.8BG/s in dual channel symmetric mode assuming DDR2 800MHz. Moving down to the slots, it features got one PCI Express x16 slot (PCI Express 2.0 compliant), two PCI (PCI v2.3 compliant) and to round it out, three PCI Express x1 slots (PCI Express 1.1 compliant). It's also sporting a total of 12 USB ports (four USB ports on the back, and four USB 2.0 headers for additional USB ports) all running USB 2.0. There's one IDE connection that'll support up to two IDE devices running Ultra ATA 133/100/66/33 modes. Finally, six SATA ports supporting up to 3.0Gb/s each. There's the standard PS2 keyboard/mouse connectors, LAN, COM and audio ports on the back (with a 6 channel line out), which you may not use depending on your add-on cards. Getting the motherboard into the case was a pretty easy job. I installed the I/O template first, then all the mounting screws which made it nice and secure. Once I was sure the motherboard wasn't going anywhere I started slapping everything else in. First was the CPU, which much like everything else went in without any issues. Then the CPU cooler, and last the memory. After a few checks I plugged in the ATX power connector, then the front panel connector for power/led/etc. With one final check to make sure no metal was touching anywhere, I pressed the power button. With a barely audible whirring, everything started up. Insert my audible sigh of relief here. The layout of the motherboard and the case made getting all the rest of the cables plugged in and situated pretty easy. There are no real hoops to jump through and I didn't come away losing any skin. After getting all the cables plugged in and the hard drives installed, it was time to get started with the software side. 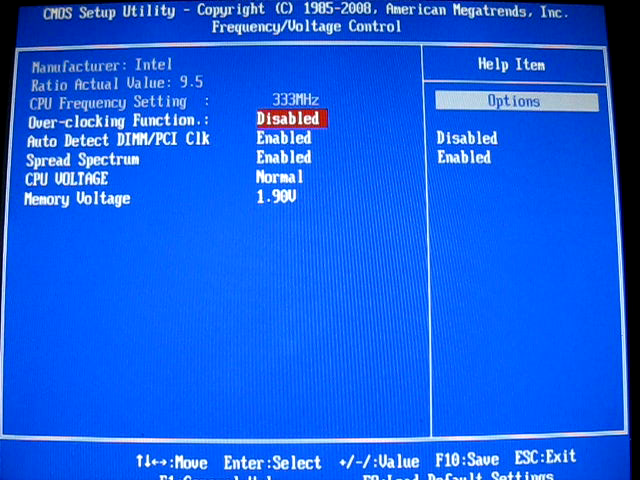 As expected, a familiar BIOS screen comes up, and the DEL key gets you into the menu. There's also the option for pressing F11 that will get you into the boot selector. Sometimes it's hard to believe how many years I suffered through boot floppies and CDROMs to finally get to this point! Now you can just slap the OS anywhere you want, and pick which spot you want to boot from. But enough on that. 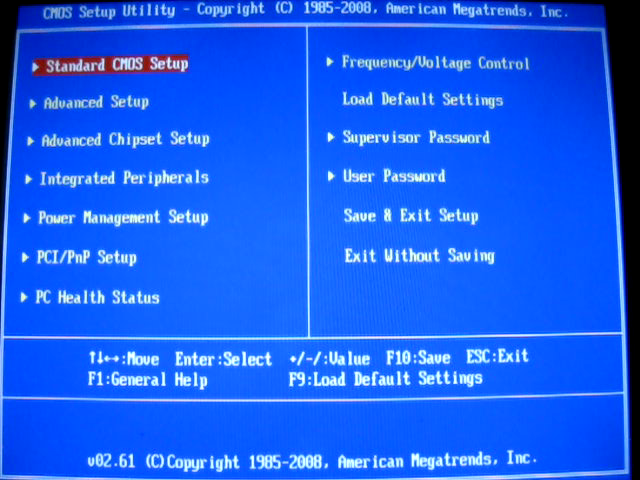 From the DEL key you get into the BIOS options. Most of it is all pretty self explanatory. The category to note is the Frequency/Voltage Control. This is where you can get into a little tweaking of the settings. But you probably knew that already didn't you? On to the Windows install! 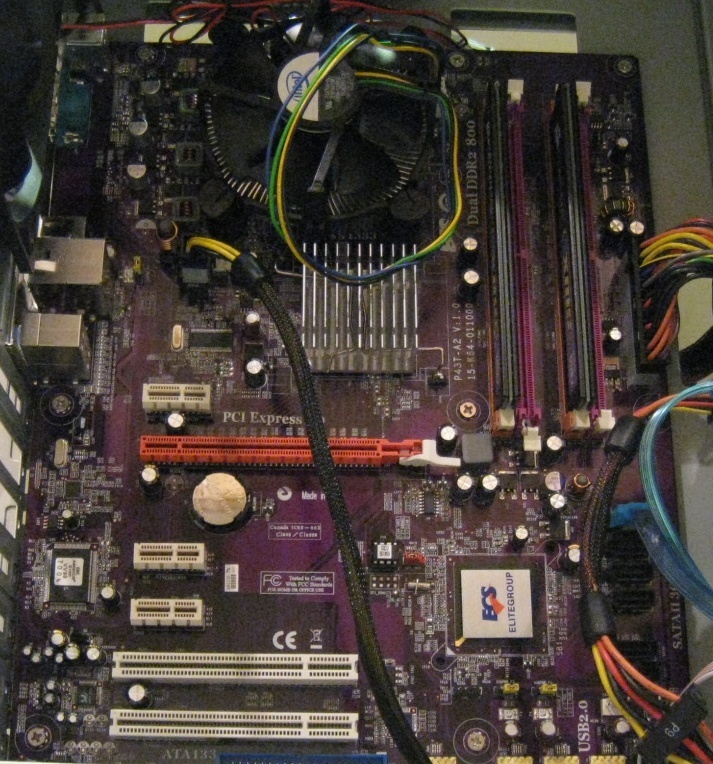 First off, I'm running this board with a Intel Dual Core 3.16Ghz processor, 2GB of Corsair XMS2 DDR2 800 memory and a ATI Radeon X850XT (Yes, I know it's old. I'm just getting into the hardware writing stuff!). I also stuck a 500GB Samsung SATA drive in there to install Windows. Windows installed without any problems at all. The board came with a driver CD, and sticking it in got everything else installed that I needed. The network came up right away, with audio and everything else. I had to download the latest ATI drivers, but once I had those installed everything snapped into place. The driver CD was an outstanding piece of work. It was very intuitive and there was no weird error messages or trouble installing any of the drivers, however this was a clean install of Windows XP with Service Pack 2 already included: your mileage may very. Kudo's to ECS for a nice driver CD. It might a little thing but I know we've all suffered through horrible driver installs. After wading through most of the usual Windows Updates, installing a few things here and there, I was all ready to try out a few games! I did not run benchmarks for a couple reasons. First, the hardware I'm using is quite out of dated / not top-end, giving meaningless results (which is often the case with motherboard reviews in the first place which are rarely responsible for large performance differences...) Secondly, like I said in my first article, I'm not just an enthusiast following cutting edge hardware; I'm more about what does and doesn't work and why I like it. It's a bit subjective, but I like to think this approach will appeal to quite a number of readers out there who are just like me. To test the board with this system, I installed Call of Duty 4 (COD4), Spore, and Microsoft Flight Simulater X. These games offer a rounded suite and I enjoy playing them. I first tried COD4 with the recommended settings, but found I was able to bump up the resolution without sacrificing much of my frame rate. Flight Sim X did just fine, even after increasing the scenery and upping most of the other options. Then again, I'm not trying to punish the machine with Crysis until I upgrade the video card. Overall, I had a great experience with the ECS P43T-A2 motherboard. Straight out of the box it worked, there has no instability, crashing, or blue screen of death. I've been running it for about a week straight playing COD4, watching some Netflix streaming on it (which comes across at a very nice resolution for TV shows! ), and just general web surfing. Thus far there's nothing I've done thats really slowed down anything and no issues were experienced. The design is well planned and the driver suite was excellent. The BIOS allows for flexible overclocking and fine tuning for more performance. All in all, it's a solid motherboard and one that I would definitely recommend to buy.